Daily Survival: Growing Apples in the Prepper's Garden, by Whit H.
Growing Apples in the Prepper's Garden, by Whit H.
I am a commercial apple grower in New England and in this article I will explain why the prepper should consider growing apples and how they should do so. Most importantly for a survival situation, a large apple contains over 100 calories that can be stored and saved for months with the appropriate storage conditions. While one can not survive on apples (or any other fruit) alone, few plants can produce the quantity of versatile calories that the apple tree does. For example, apples can be eaten raw or made into applesauce, dried apples, boiled cider, hard cider, or cider jack. 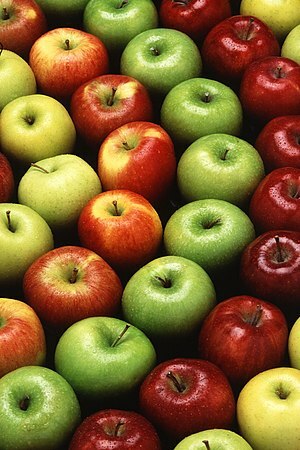 Apples contain dietary fiber, Vitamin C, and antioxidants. Apple trees need full sun. Like most crops, they will not do well below the forest canopy next to a hidden mountain retreat. Traditionally, farmers have planted orchards on marginal, hilly land. Save your prime, flat, rock-free land for growing vegetables and grains. Slopes promote airflow (which can reduce some tree diseases) and they give cold air a place to go to, reducing frost damage. Well-drained soil is best; swampy wet soils will rot the apple tree roots. Rocky soils are okay, as long as the initial planting hole has large stones removed from it. Some books will tell you to plant on the southern or eastern slope of a hill, but most of us are not going to have a lot of choice and just have to work with whatever land that we have at hand. If you are attempting to conceal your position, then plant your trees in a field or slope at random. From a distance, apple trees can appear like other trees. The easiest way to spot an orchard from a distance is the orderly spacing of trees in a grid. More than almost any factor, tree selection will determine your success or failure. There are several issues to consider. 2) Rootstock: You'll notice that a lot of apple trees are planted on dwarf rootstock. Commercial orchards traditionally liked dwarf rootstocks because they created dense orchards with short trees that were quick to produce and easy to spray and pick. The downside is that dwarf rootstock trees are not as vigorous, long-lived or tough. A dwarf rootstock tree can die after a few years of neglect or even after 20 years of excellent care. On the other hand, I have seen abandoned orchards planted on standard (full size) rootstock that still produce apples after decades of neglect. If you have ever seen an big, ancient apple tree, it was almost certainly planted on standard rootstock. I strongly suggest that the survivalist should try to select standard rootstock for his apple and fruit trees. The extra vigor and hardiness will serve you well in a world where you won't always have the best pesticides or the ability to replace trees easily. With careful pruning, a standard rootstock apple tree can easily be kept to a manageable size. 3) Variety Selection: You may love buying Fuji apples at the store, but that does not mean that you should try to grow Fuji apples at home. Apples vary greatly in terms of their vigor and disease-resistance. Many of the store varieties are disease-prone and require lots of pesticide and fungicide sprays. You probably don't want to be stock piling extra pesticides and fungicides in addition to everything else you will need in TEOTWAWKI. Many of the most popular apple varieties are bred to look pretty in grocery stores. (I have one variety in my commercial orchard that's only claim to fame is that it is redder than other similar varieties.) For the prepper looking to grow apples to survive or just the do-it-yourselfer looking to grow their own food, I strongly suggest that you consider one of the new vigorous disease-resistant cultivars like Liberty or Freedom (Freedom is more tolerant to warmer climates). 4) Crab Apple: Even better than one of the new disease-resistant cultivars are most crab apple trees. I find crab apple trees to be exceptionally hardy, vigorous, and to require very little spraying or maintenance. Now I don't mean ornamental flowering crab apples (which are primarily bred for their flowers and produce marble-sized fruit), but culinary crab apples like Chestnut Crabapple and Dolgo that produce fruit about 2" in diameter. They can be more time consuming topick, but they amaze me in their ability to thrive in most conditions and be unaffected by apple tree diseases and pests. I picked Dolgo crabapples from an unmanaged orchard that were nearly perfect. They often have a much more tart flavor (which is likely what makes them less appealing to pests, but also means they likely have more vitamins and antioxidants.) They can be eaten raw, but also are great for canning, cooking, and cider. 1) Planting: Planting trees is generally done while the trees are still dormant in the spring, although it can be done in the fall in milder southern climates. As my father used to say, you want to" dig a ten dollar hole for a two dollar plant". A large, 18-inch-deep, 3 foot-wide hole will ensure that your new tree's roots have plenty of good uncompacted soil to grow into. If your tree's roots are happy, the rest of the tree will probably be happy. If your soil is depleted, you may want to add organic material like compost and some very light fertilizer at planting, although most decent soils will work fine. You want to plant the tree at roughly the same height was planted in the nursery, making sure the graft line is off the ground. The most important practice is to water the tree the entire first growing season. I typically water each tree with 3 gallons of water twice a week, counting any significant rainfall event (~1") as one watering. Dumping 5 gallons of water once a week is also okay-- the goal is for the tree to develop deep roots. If your soils are sandy and drain quickly, you may need to water more frequently, conversely if your soils are soggy, then make sure you don't overwater. Healthy new trees can take a fair amount of wind, however if you have a very windswept site, you may need to stake the tree the first few years. If you can, mulch around the trees to keep weeds and grasses back for the first few years to make sure the tree is not competing for nutrients before its roots have fully established themselves. 2) Pruning: You can find lots of online and book guides to pruning apples trees, so I will touch on the most basic ideas here. Timing is important. You primarily just want to prune in the winter after the worst of the cold weather is over, but before the tree comes out of dormancy (about March in New England). The first step is to cut out any dead, diseased, or crossing branches. Then, you want to cut out wood to encourage the tree to spread out on strong branches. They say "you should be able to throw a cat through a well-pruned tree". This means there is good air circulation and sun. Burn all prunings to prevent them from becoming a disease host. 3) Spraying: Apples trees can be beset by a host of diseases and pests that tend to vary from region to region. Ask a local farmer or nursery what the typical diseases and pests tend to be. Growing organic apples in the Eastern US without significant crop losses can be very challenging. Organic apple growing in the arid West somewhat easier; however, you will have to ensure that you have a steady source of irrigation water in a survival situation. Sprays of a broadband insecticide and a fungicide (which can be done with a common backpack sprayer) early in the growing season (after petal fall to avoid killing bees and pollinators) will likely dramatically increase your yields. If you don't like the idea of being dependent on pesticides and fungicides, then I strongly recommend that you go with culinary crab apple trees. 4) General Orchard Care: If you can, rake up all the apple tree leaves in the fall and burn them, as they can harbor diseases (like apple scab) from year to year. Deer will eat off all the lower fruit buds on your trees, leaving you with no fruit below eye level. However, in TEOTWAWKI, if there are any deer left in your area, you will likely have no hesitation about hunting them out of your orchard. 1) Harvesting: Harvesting apples is not rocket science. When they taste ripe and easily come off the tree, then they are ready to harvest. 2) Storage: Commercial orchards store apples in refrigerated rooms without any oxygen. That's how you can eat a 10 months old apple in July in the US. At the personal scale, you can still store apples for months in a low temperature, high humidity root cellar or basement. Periodically check your stores and throw out rotting apples. The expression "one bad apple spoils the whole bunch" comes from somewhere. For longer term storage, you can dry apples or can them as applesauce or juice. I plan to discuss the basics of making hard cider and fruit wine in an upcoming article.